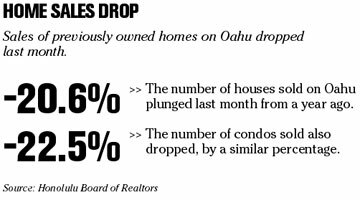 Some in Honolulu's real estate industry blame April's dampening in home sales -- which newly released data show down more than 20 percent for both single-family homes and condominiums -- on the rain. But others are convinced the downturn is more the result of inventory mix and the market's position in its historical cycle, which tends to ebb and flow as prices top out. Despite last month's glitch, prices are expected to continue rising while the number of sales transactions slow until the market eventually reaches its peak and moves sideways. Though there are signs that the market is moving in that direction, it's not there yet. "Overall, it's back to a normal market, and if a property is priced and marketed appropriately it will sell," said Cherie Tsukamoto, broker-in-charge ofEast Oahu Realty. While market softening has allowed buyers to negotiate more than they have in the past, most buyers are getting within 97 percent of their asking price, Tsukamoto said. "The market is still healthy," she said. Some 332 single-family homes and 584 Oahu condominiums changed hands last month, compared to 418 single-family hones and 754 condominiums a year earlier, according to statistics released yesterday by the Honolulu Board of Realtors. The significant drop in sales transactions also has been linked to the 5 percent or so drop last month in median prices for both houses and condos. Oahu's median single-family home price fell to $615,000 in April from $650,000 in March. 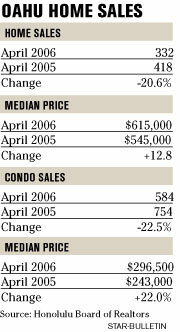 Condominium prices fell to $296,500 in April from $312,000 in March. Both April numbers were well above year-ago figures of $545,000 and $243,000, respectively. There shouldn't be any long-term effects from the unusual weather in Honolulu last month, but it certainly played a role in April's statistics, said Mary K. Flood, president of the Honolulu Board of Realtors. "Sales this April were less than the unit sales volume in April 2005, caused mainly by the record rainfall that kept buyers at home and away from shopping for housing throughout the state," Flood said. While weather could have played a factor in the market last month, it's unlikely that it could have been responsible for such dramatic fluctuation, said William S. Chee, chief executive officer ofPrudential Locations. "I've never heard anyone here blame the real estate market on the weather -- that sounds like something you'd hear from a much colder climate," Chee said The sales data could have been skewed by the mix of properties sold, he said. Honolulu's residential real estate market has been cooling since last October, he said, and sales are expected to continue softening with prices appreciating at a slower pace. Quarterly results, which reflect a gradual upward tick, show that the market is still very stable, Chee said. "The median home price has actually risen for the last four quarters," he said. The rolling quarter, comprised of February, March and April sales data, shows a median house price of $626,000, a scant increase of 0.6 percent from the previous quarter's $622,000, according to Prudential Locations statistics. The median condominium price of $308,000 for the rolling quarter reflects 2 percent growth from the previous quarter's $302,000. For the full year, prices are expected to increase between 10 percent to 15 percent, said Harvey Shapiro, research economist at the Board of Realtors. "We're still on our way up," Shapiro said, though an increase in the number of homes for sale combined with a rise in prices and interest rates is expected to create further slowdown in the marketplace. Last month, 1,644 single-family homes were on the market, more than double the 814 that were listed in April 2005. The number of condominiums that were on the market last month, 2,278, was nearly 2.5 times the inventory recorded during the same period last year. "The market is a supply and demand model and right now supply is expanding but demand is not," Shapiro said. Many buyers who wanted or could participate in the market already have, but it's still a good time to buy for those who can afford it, he said. "Anyone waiting on the sidelines for the price to drop will probably be disappointed," Shapiro said. "If you were in a position to purchase last year and you had decided to wait, at this point you'd say that it was an awful decision."